In 1921, at the AGM of the Bridport Cricket and Lawn Tennis Club, the secretary reported that a ‘lawn bowls’ section was to be started and, in 1922, a new green costing £200.00 was laid as part of a composite sports club at the Brewery Field, Skilling (now the Bridport Leisure Centre). The Bridport Bowling Club was officially inaugurated in 1923 with a membership of 32 and was elected to the South Dorset League. In April of that year a timber ‘pavilion’ was constructed and the club membership quickly rose to 60. the club was affiliated to the Dorset County Bowling Association in 1926. Although interest in lawn bowling continued to increase, in 1929, the club President Mr W S Edwards, a local and successful businessman, confirmed that due to difficulties which had arisen between the three sections of the sports club, it had been decided to start and operate a separate bowling club. Mr Edwards referred to a plot of land he owned behind St Mary’s church and close to the River Brit which he was willing to convey free of charge, to the new club. It is remarkable to learn that a new bowling green was laid at a cost of £750.00, involving 16,000 square feet of Cumberland turf brought from South Wales and that, apparently, it was open for play on May 9th 1930 – only 6 weeks after it had been converted from waste land! 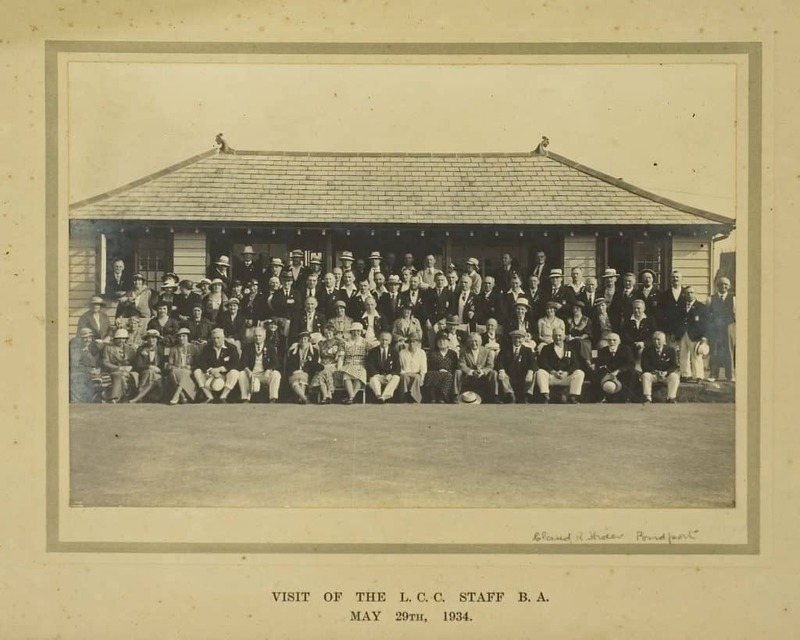 On the 6th June 1930 a new timber clubhouse was opened at a ceremony attended by 4 Past Presidents of the English Bowling Association , the President of the Dorset County Bowling Association and representatives of the Bridport Town Council. The club membership had increased to 80 and the subscription for that year was set at £1.50 per annum!. The club’s founder member, Mr W S Edwards, died in 1932 but the following year Mr W H Margrie, the manager of Lloyds Bank became the first Bridport member to be elected County President. Since then seven further members have been selected to that high office. In 1934 it was resolved that ladies should not be admitted to club membership but that one day should be set aside each season when members’ wives could be allowed to use the rinks and be entertained by men members! All activities at County level were suspended during the war years 1939/1945 although the club continued to function on a strictly local basis. From the available records it seems that an air of apathy prevailed on the years immediately after the war for by 1067 there were only 31 members although a sign of changing times was the inauguration of a ladies section in 1965! However, new housing developments in Bridport and the surrounding area attracted many retired families to this part of West Dorset and the club found a new lease of life with the membership increasing to 58 in 1969. In 1981, a strip of land between the bowling green and the River Brit was purchased by the then secretary, Mr Bill Bailey, and given, without charge, to the club. Although only allotment land at the time, there was a possibility that, at some future date, an indoor bows facility might be constructed. In the event this did not materialise but the strip of land in question, gifted to the club, now constitutes a substantial part of the site on which the new clubhouse stands. Club membership continues to grow and there are now some 135 playing members and 12 social members. For many years discussions had taken place and funds raised with a view to providing a new and larger clubhouse to replace the structure which had been the clubs ‘home’ since 1930. Many club officers and members gave their time and energy towards this project and with the much appreciated financial support of the Foundation for Sport, the EBA , local authorities and other agencies, we now have a modern, spacious and well equipped clubhouse, which can be used in the winter months for short-mat bowls , ad which we trust will serve our needs for many years to come and in the words of the late Mr Harry Castle, the Club President in 1973, at the celebration of the club’s Golden Jubilee, will continue to “provide abiding happy friendships, recreation and fun” for the bowlers of Bridport.